Teknetics T2 Classic Metal Detector - FREE shipping! The Teknetics® T2 metal detector is an American Classic now offered at a much lower price! When this detector was first released the price tag was $849 -- now it's only $499! The T2 is a high-performance, multi-purpose professional grade metal detector. It utilizes the latest advances in electronic technology, and its functional design represents the leading edge of the metal detector engineering art. The T2 is easier to learn to use properly than other comparable metal detectors. 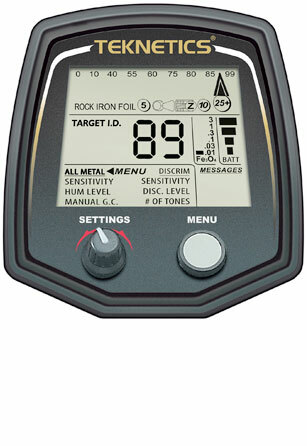 Its combination of light weight and balance provides comfort unmatched by any other detector in its price range. Its most popular uses include coinshooting, relic hunting, and gold prospecting. Low Operating Cost with 4-AA alkaline batteries. Use ALKALINE batteries for best performance. Expect 40 hours of service in the field with one set of ALKALINE batteries. If you use rechargeable batteries, good-quality NiMH (nickel-metal–hydride) batteries are recommended. They will usually deliver over 25 hours of service without recharging, but when they start running low, they die suddenly with little warning. Always install batteries which are of the same type and the same state of charge, otherwise battery life will be determined by the weakest battery, as the good batteries cannot deliver their power with a dead battery blocking the current. The lead engineers on the T2 design team were John Gardiner, firmware engineer, and David Johnson, whose expertise is behind many of the best-known high-performance metal detectors offered by major U.S.manufacturers for the last 26 years. Mechanical: S-rod with electronics housing mounted on handgrip, 3-piece breakdown, batteries under elbow, 2-way armrest adjustment — forward/backward & around forearm. Searchcoil: 11” (28 cm) open-frame elliptical double-D, waterproof. Batteries: 4 AA, alkaline or NiMH (not included). Weight: 3.5 pounds (1.6 kg) with alkaline batteries installed. Static Balance: force in vertical plane normal to elbow 0.47 pounds (0.22 kg).Varies with adjustment and user’s stance and arm/hand physiology. Dynamic Balance: axial moment, 0.29 foot-pounds (0.39 newton-meters). Varies with adjustment and user’s stance and arm/hand physiology. Sweep Effort: lateral moment 5.2 foot-pounds (7.1 newton-meters). Battery Life: typically 40 hours with good quality alkaline, somewhat less with NiMH rechargeable. Original price when first released was $849 -- NOW JUST $499! Most metal detectors, like the Teknetics T2, use VLF Induction Balance technology. Here’s how it works: The searchcoil (also called search head or loop) contains two electrical induction coils which are like antennas. One coil transmits a rapidly alternating magnetic field, illuminating the region surrounding the searchcoil. If metal is present, its electrical conductivity distorts the magnetic field. If iron metal is present, its magnetism also distorts the magnetic field, but in a different way, allowing the metal detector to distinguish between ferrous and nonferrous metals. The other coil is a receiving antenna which detects changes in the magnetic field caused by the presence of metal. Electronic circuits amplify this weak signal, analyze it to determine the changes which occur as the searchcoil sweeps over the target, and then convey the information to the user in the form of a visual display or audio tones. Most modern metal detectors perform many of these tasks in software running on an internal microcomputer. The iron minerals which are present in most soils also distort the magnetic field, obscuring the weak signals of small or deep objects. This can cause the object to go undetected, or to be misidentified when it is detected. Much of the technology that goes into modern metal detectors is devoted to the task of eliminating the unwanted signals from iron minerals in the soil, while not losing the signals from metal objects.